KIAWAH ISLAND, S.C. – With so many golf facilities struggling these days, Roger Warren’s report on the popular Kiawah Resort is eye-catching to say the least. Roger Warren has plenty of good memories from his recent Ryder Cup experiences. This five-course facility near Charleston, S.C., doesn’t need a commercial after already hosting an historic Ryder Cup (in 1991) and a major – the PGA, won by Rory McIlroy. Its Pete Dye-designed Ocean Course has witnessed it all, and it’s due to witness another big one. The PGA of America has announced that the PGA Championship will return to Kiawah for its 103rd playing in 2021. 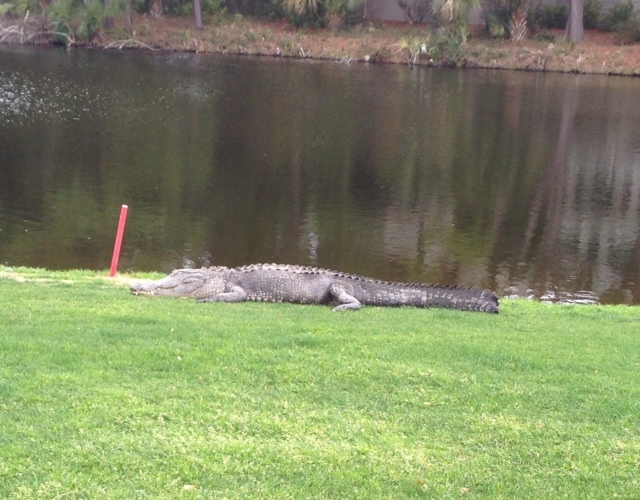 The return of the PGA seems reasonable but it’ll be awhile. A year later, though, things would be much more enticing. “In 2021 that’d be the 30th anniversary of our Ryder Cup, and it’d be nice to play on that history, what those ’91 matches meant to it,’’ said Warren. If not a PGA, then what? 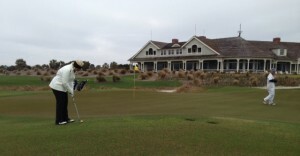 The Kiawah clubhouse provides a dramatic backdrop to the finishing hole at the Ocean Course. 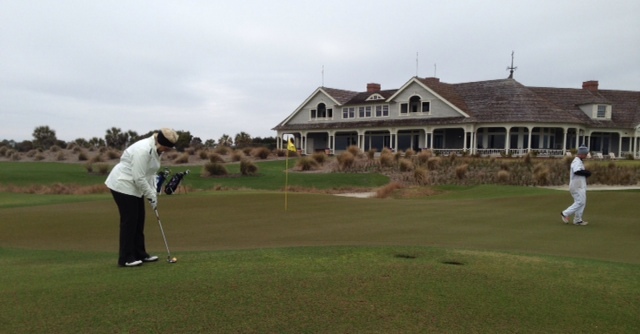 Kiawah’s bottom line, though, isn’t getting another big event on its most prestigious course. Kiawah is much more than the Ocean Course. The other layouts will get special attention over the next few years. Osprey Point will get a makeover this year, Cougar Point in 2015 and Oak Point the year after that. Things were much different when Warren arrived in 2003. A Western Illinois University graduate who grew up in the downstate Illinois community of Galesburg, Warren started in golf working three summers at Village Links, Glen Ellyn’s 27-hole facility. His main job was as a high school teacher and basketball and golf coach, first at Dundee Crown and then at Illinois Math and Science Academy. He didn’t enter golf full-time until he was 38, when he took the head professional’s job at Village Links in 1986. He moved on to Seven Bridges in Woodridge , IL., when that facility opened in 1991 and remained there until going to Kiawah. Alligators at the Turtle Point course measured in the eight-foot range. Not long after that the interim tag was lifted and Warren was promoted to president of the resort. He presided over the opening of its Sanctuary Hotel in August of 2004. At the same time he was climbing the ranks of the PGA of America hierarchy. He served as that organization’s president in 2005-06. The PGA duties were all voluntary, but they kept him away from Kiawah for 132 nights. That’s not unusual for the men who have held that job since then. But he did then, and Kiawah has thrived. Warren arrived at Kiawah after the Ryder Cup effort in 1991, but he has great memories of the event in his capacities with the PGA. 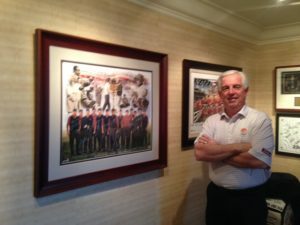 He was captain of the U.S. team in the Junior Ryder Cup competition during the last staging at Medinah. Medinah’s Ryder Cup, though, got Warren thinking about changes to improve the epic competition.